Honored by the West Unity Area Chamber of Commerce during their annual banquet held on Wednesday, November 5 was Lewis D. Hilkert. Known to most in the Williams County area as Lew, Hilkert was born and raised in Lewisburg, Pennsylvania and is the youngest child of the late Raymond L. and Helen M. Hilkert. Lew is a 1968 graduate from Lewisburg Area High School in Lewisburg, Pennsylvania. Additionally, Lew graduated from the Ohio School of Banking in 1977, the Ohio School of Consumer Credit in 1979, the Ohio School of Commercial Credit in 1981, and the Graduate School of Banking in Madison, Wisconsin in 1997. After completing his basic training in the U.S. Army National Guard, Lew worked in the retail management program for JJ Newbery Company and was transferred to Bryan as a store manager in 1973. Lew eventually accepted a position with the Farmers and Merchants State Bank in 1974. Lew’s involvement in West Unity first occurred in 1981 when he was promoted to office manager of the West Unity branch. Lew continues his work with Bank today as a Commercial Development Officer. Additionally, Lew was appointed Williams County Commissioner in 2007 and is currently serving his second elected term. Lew married his high school sweetheart, Gayle, in 1970 and they have four children: Wendy (Mike) Davis of Tampa, Florida; Tammy (Tyson) Stoll of Toledo, Ohio; Lindsay (fiancé Aaron Rock) Hilkert of Eatontown, New Jersey; and Tyson (Nikki) Hilkert of Pataskala, Ohio. Lew and Gayle’s grandchildren are Drew Davis (fiancé Marin Willis), Clay Delaney Davis, Ava Stoll, Elly Stoll, and soon to arrive Bella Hilkert. Lew has served three terms for a total of nine years on the Board of Directors for the West Unity Chamber, including as a past president. He and Gayle attend New Hope Community Church. Lew has also been very active in his involvement over the years with the Hilltop Athletic booster, the Milcreek-West Unity School Finance Committee, and the Unity Tractor Club. Currently Lew serves on the West Unity Area Foundation as President, County North Foundation, Williams County Economic Development Corporation, Williams County Revolving Loan Fund, Williams County Republican Central Committee, Northwest Ohio Community Action Commission, and the Northwest Ohio Area Office of Aging. He is also the chairman of Maumee Valley Guidance Center and Secretary of the County Employee Benefit Consortium of Ohio. When he does have spare time’ Lew enjoys hunting; spending time at the lake; and, most of all, spending time with his wife and family. In his acceptance, Hilkert expressed that he was both “honored and humbled” by the honor as well as that he would like to share it with the community as a whole. Expressing his sincere gratitude to all of those that had mentored and supported him in the past, Lew also expressed his hope that he and others would continue to mentor and support others so that West Unity can continue to grow. He also expressed his love and pride in his family and noted that, while his children have all grown up and moved to various parts of the country, that they have all found success in their life. Lew shared his belief that his children’s success throughout high school, college, and into their adult life has been due to the firm foundation that they received from the partnership shared between the West Unity Community and the Millcreek-West Unity school system. Lew’s contributions and service to the West Unity area and the county as a whole are sincerely appreciated and his efforts to serve and better the world around him are as such that is hoped others will learn from and emulate. 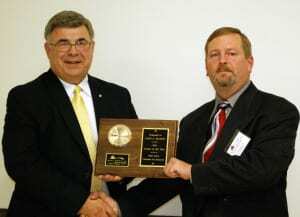 Be the first to comment on "West Unity Area Chamber Of Commerce Honors Lewis D. Hilkert As Citizen Of The Year"